Theatre for a New Audience invites you to become a permanent part of Polonsky Shakespeare Center by participating in our seat naming campaign, A Seat for Shakespeare. You can name one seat for $5,000, or two seats for $9,000—for yourself, in honor or memory of loved ones, or to commemorate an important anniversary or life event—in a plaque of brushed aluminum on a seat in the Samuel H. Scripps Mainstage. Thanks to the support of The Polonsky Foundation, we are able to offer a very special seat naming opportunity. For a limited time, you can name seats that have special plaques on the seats’ backs, featuring Shakespeare’s plays and their years of first performance. Distributed throughout the orchestra level of the Mainstage, 38 of Shakespeare’s plays can be permanently associated with your personal naming plaques. You can also name a seat on its own (not associated with a Shakespeare play). 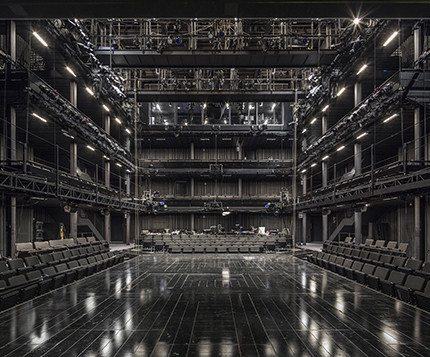 Pictured above: Polonsky Shakespeare Center, photo ©David Sundberg/Esto; Samuel H. Scripps Mainstage, photo ©Francis Dzikowski/OTTO.